Since this will be for weaving, I decided to use two different alpaca fleeces, each for about half of the total skeins. 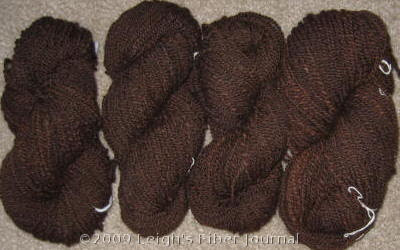 You can't tell from the photo, but the one skein on the left is from a different alpaca than the three on the right. When compared side by side, the two are not identical in color. My idea was to use one for the warp and one for the weft. There doesn't seem to be much visual difference in the yarn color however, so I doubt it will matter in the end. This is a Folkwear pattern. As you can see from the line drawings on the left, the pattern pieces would be perfect for handwoven fabric, especially if I decide to weave and piece it in a variety of twill patterns for example. Of course as I sit and spin, I can't help but make changes as per Random Thing #9. For example, I think I might prefer it a little shorter, like a long jacket. I haven't signed on the dotted line yet for my pattern choice, so this may change. I'd like to decide soon, however. Then I will know how many yard of fabric I will need, so I can calculate how many yards of yarn to spin. Decisions about a weaving draft will be much later. I've always loved that coat! I've also drooled over Folkwear patterns for years, but not being much of a sewer, never really wanted to invest in one. It's funny because I couldn't see the difference in the yarns until you mentioned it, and then I could totally see it. Weird! This is quite a project! The color is beautiful and now I have a HUGE appreciation of your spinning! That's the only Folkwear pattern I have, and I've had it for over 30 years! Unless the pattern has changed, be sure to add room to the sleeves and underarms. The yarn is gorgeous and coming along nicely! Looks like you are making wonderful progress! I love that coat pattern. Can't wait to hear what you decide for sure regarding a pattern. So you're going to do it. Good for you. I still want to so will be close attention to your experience. The skeins are yummy! Your yarn is geogeous!!! I'm sure it will work up into a beautiful coat. I thought of you this morning. I met with my local weaving group, and one person brought some fabric she'd woven. Part of her work was a sample where she used 2 cones of lilac yarn. She said they looked identical on the cones, but woven in the sample - a twill with a white warp, you could definitely tell the difference in color. Sue, that's interesting. Maybe I should keep those skeins separate and go ahead with my plan. Who knows, it may make a bigger difference than I think! Thank you for the comments on my yarn! Very encouraging because a long term project like this can get boring, especially for someone who loves color as much as I do. Connie, thanks for the tip! I will for sure do a muslin of this before getting sissors anywhere near my handwoven handspun! Oh I love this coat! And like Connie, I have the pattern (and several others from the 70s). 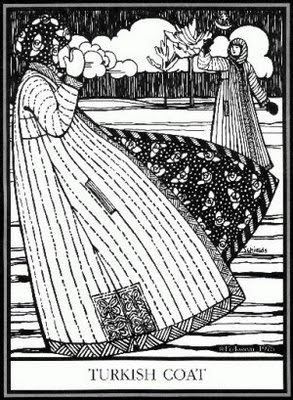 I love Folkwear patterns, and they really are timeless. I agree, that you'll want a little more room in the arms and underarms. They're also great (the old ones at least, I haven't needed to buy new ones) because instead of tissue paper, they are printed on good sturdy paper so they last forever. Your yarn is beautiful and really is getting me excited about taking our upcoming spinning workshop with Norman Kennedy. As you know, I'm an accidental spinner, and am a bit intimidated by the whole process. :) If I can ever spin just one skein that looks even remotely like yours, I will be thrilled, let alone an entire fleece! You are in my list of fiber superhereos. Thanks too for the info on the Folkwear patterns. I'm really leaning toward this one. Maybe next time I'm at a store that sells them I'll get it. That is so cool! My ultimate goal is to weave for sewing, so I can't wait to see how this comes out! I've used Folkwear's Kimono pattern and I really loved it! It had all kinds of interesting information about traditional kimonos in addition to the actual pattern and instructions. Holly, interesting question. This morning it's 25 degrees F. out there. It's true that we generally have mild winters, but we commonly get lows in the 20s and some days don't get out of the 30s. Then it's usually a damp cold, which makes it feel even colder. I don't need something really warm a lot, but I do often enough to make this project worth while. One mildly annoying thing about living in the south is the merchants' perception of winter clothing. What is sold as a winter jacket down here would be what we would have considered a fall jacket where I grew up in the Midwest! The stuff is wimpy for those days of windy, damp, hovering-around- freezing weather. I love the folk pattern it looks like a fun sewing project. What great yarn! I am envious of your lovely spinning, I have wheel and fleece but need more practice before I can use the yarn. 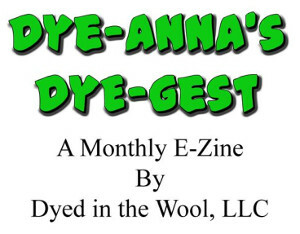 I also need to learn to dye! Followed your lonk to Folkwear. The coat is magnificent and just asking to be made up in a rich textured cloth. I love the shade of brown in those skeins. And to have so much done deserves congratulations. Spinning a whole fleece is an exercise in persistence for me. After about eight ounces, I start to get antsy. You must be a math wizard!